SHAMPOO.IE - SPLIT ENDS? This is the blog for you! Say goodbye to your split ends with these saviours from Shampoo.ie! Trichoptilosis schizotrichia, informally known as split ends, is the splitting or fraying of the hair-shaft due to excessive heat and mechanical stress. Whilst regular trims by your hairstylist is an important way of removing split ends, unfortunately they are somewhat inevitable in some way, shape or form for everyone. There are 4 typical causes of breakage and split ends in hair; most are due to stress from external factors such as mechanical, physical, and environmental. Physical and mechanical breakage can be a result of improper detangling or heat styling without using protecting products. Environmental breakage is caused by environmental factors that damage or break the hair, e.g. dryness that is caused from hot summer sun. Semi Di Lino Split Ends Recovery Fluid - €13 - 125ml - Combats problematic dry, split ends by replenishing the hair shaft and forming an invisible film that coats the ends. Kerastase Touche Perfection - €20 - 40ml - A replenishing balm for Touch Up On-the-Go Nourishment for Dry Ends & Immunity from Dryness Anytime, Anywhere. L'oreal Professional Seria Expert Sealing Repair Lipidium - €17.99 - 30ml - A leave-in double serum for sealing split ends and repairing very damaged hair. Kerastase Resistance Serum Therapiste - €37.60 - 30ml - A luxury dual treatment for fiber quality renewal and care of extremely damaged lengths and ends. Shu Uemura Essence Absolue - €55.60 - 150ml - Shu Uemura Art of Hair Essence Absolue is a rich, nourishing protective oil that replenishes lost moisture to dry, coarse and damaged hair. Essence Absolue protects hair from sun damage and masks split ends for a sleek, smooth and radiant result. 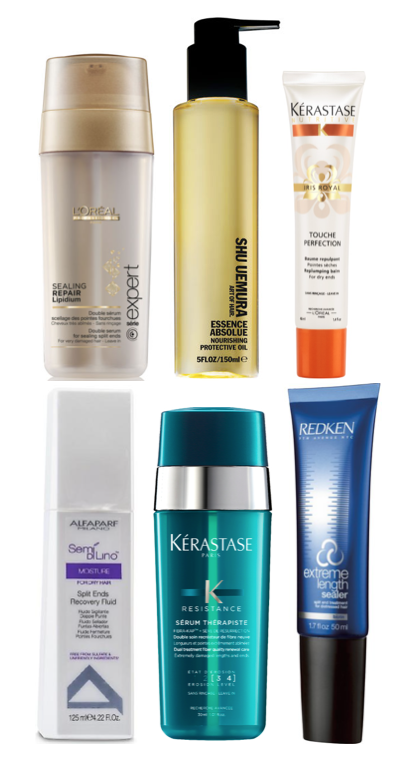 We are proud to be an official Irish stockist of Redken, Semi Di Lino, L'oreal Professional, Kerastase and She Uemera.